If you are experiencing pain and swelling to the top of the foot and you have had x-rays that don’t show a fracture be careful. Swelling and palpable pain to the metatarsal bones on the top of the foot are the key factors in determining the diagnosis of an early metatarsal stress fracture. The problem is that many patients are seen by their primary care provider who will often take x-rays and then depend on the x-ray report produced by the radiologist to initiate treatment. Often times the radiologist will report normal x-results because it will take at least two weeks before the radiographic changes are visible. 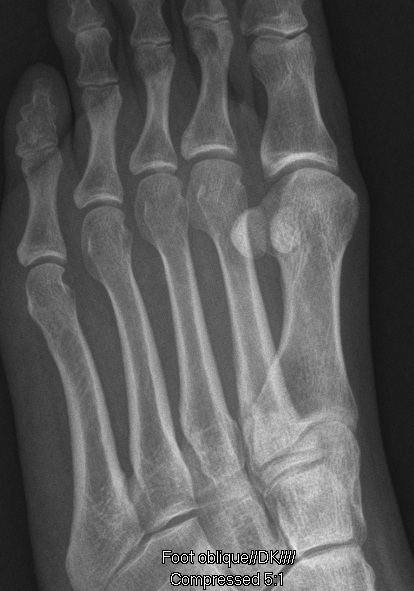 The following x-rays represent a good case history of a patient who had not been diagnosed adequately with a stress fracture. This patient presented to her primary care physician who had x-rays taken that were negative. The patient was sent home with instructions to ice and take ibuprofen but continued to have pain. Three weeks after her initial x-rays the patient had persistent pain and asked to be seen in consultation with a podiatrist at which time she was referred to our office. We repeated x-rays now confirming the location of the fracture at the third metatarsal. 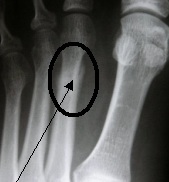 The changes on the repeat x-ray show thickening of the cortex region of the third metatarsal at the area of the fracture. The patient experienced immediate pain relief with the use of a CAM boot for three additional weeks at which time she advanced to her regular shoes and activity. 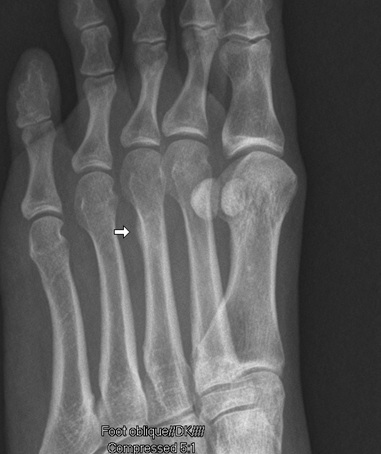 Remember: don’t rely on initial x-ray reports to determine your diagnosis of metatarsal stress fracture. 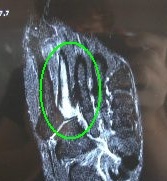 If you have pain and swelling to the top of the foot think “stress fracture”. Immobilization of the foot in a CAM boot is a great way to treat a stress fracture. Expensive studies like an MRI can be used but are costly and often times are not needed to help diagnosis and treat this injury. 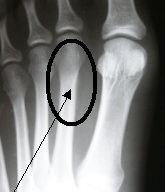 Oblique X-Ray view with small right arrow showing irregularity at Metatarsal #3.